In August 2005, there was a major Senate Inquiry into the Migration Act. 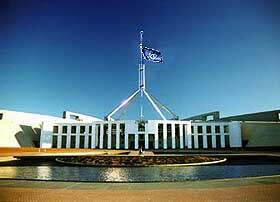 It was an inquiry, decided prior to July 2005, almost in the spirit of "the last stand" of parliamentary democracy, and partly driven by the fear for what may not be possible with an absolute majority of the Howard government after the Senate 'turns over' as a result of the 2004 Federal election. Below are the two submissions Project SafeCom sent in for the Inquiry. All submissions are listed on the Parliamentary website here. 10 November 2006: The 2005 Senate Inquiry into the Migration Act - this submission by former DIMA staffer and Migration worker Frederika Steen, who works as a volunteer for the Brisbane-based Romero Centre, is an excellent argument for the almost complete failure of the administration of the Migration Act under the Howard government's cruel set of ethics. Summary: Australia does not adhere to clauses of "non-refoulement" in the Convention when removing failed asylum seekers from Australia. Forced deportations breach the UN Refugee Convention as well as several other conventions. Removals from Australia should be in line with Convention demands and be voluntary, in collaboration with removee, as a last resort only, to a destination chosen in consensus with the removee. 1. The United Nations Refugee Convention is quite explicit about the status of refugees, also both before and after the process of acceptance by member countries. The UNHCR states that refugee status exists prior to and independent of the recognition of this status by member countries. The clear implication of this is that the Minister or politicians, or a judge or assessment panel may well say "this is not a refugee", but such statements are at all times a subjective interpretation of how that Minister, politician, judge or assessing officer views the refugee case against the guidelines of the Convention. The implication is also one where countries need to incorporate this notion in its assessment and in its public statements, for example in the media and in parliament. 2. A Convention country that cannot conclude that an asylum claimant is a refugee in their understanding and assessment still has an obligation to this claimant. The claimant may have failed the assessment, but it is not correct to call the claimant "a failed refugee", or "not a refugee" in keeping with the point made above. 3. The obligations a country such as Australia has to those who do, in its view, not fall within the criteria for refugee status, are several, but the most familiar obligation is one where we promise to "not refoule" a claimant. In common terms we promise to not return the claimant to a country where he or she is in fear of persecution. This fear, as defined in the convention, is not one as assessed during the refugee claim assessment, but solely as perceived by the claimant and as expressed by the claimant. After all, the claimant was unsuccessful in gaining refugee status, yet the country cannot say that the claimant does not have any validity when he/she expresses to have a fear for persecution when returned to the country he/she fled from. While this seems a contradiction - because the country has just concluded that the claimant's claim 'to be in fear of persecution' does not hold validity in its assessment - is simply is a truism when looking at the Convention that the assessment of "fear for persecution" is one simply as defined by the claimant. The criterion simply is "if the asylum claimant fears it". This being the case, there is a ground for 'collaboration' with the asylum claimant, also in this area. Because of Australia's non-refoulement obligations, it also stands clear that a partisan defender - such as a lawyer or migration agent of the claimant's choice, accompanies a claimant throughout this phase. 4. Australia has forcibly removed asylum seekers. To the methods during these journeys belong physical restraints such as hand-cuffs, foot-cuffs, mouths taped up, hoods, and chemical restraints - injections or oral sedatives. 5. Australia has also removed people to destinations where they are at a serious risk for further persecution, imprisonment, torture, or death. Several reports and literature now published, testify of these removals. 6. While many Convention countries apply a process of "secondary assessment" for those who cannot fall within the narrow Refugee Convention criteria, evaluating whether the claimant could be granted a humanitarian visa, Australia does not have embedded in the Migration Act such a secondary assessment system. Australia falls well short compared to other countries in this area. 7. The number of asylum seekers who reach Australia, either "unannounced" by boat or by other means, represents a mere trickle compared to other countries. 8. People who arrive by boat, unannounced, simply do so because they exercise their explicit right: the creation and formulation of the UN Convention for the Status of Refugees derives from the fact that boatpeople around the time of the Second World War were repelled from countries' harbours. Boatpeople who arrive in Australia do not have a lesser right to do so that those who arrive unannounced by plane. It is certainly not illegal. 9. The notion of "third country" when considering removal from Australia is an option that only gains credibility in the eyes of the countries approached for this purpose, if it is well-known that Australia does not shirk its responsibility but carries the weight of the world-wide refugee placement and intake, also of unannounced arrivals, and that Australia's treatment of refugees including unannounced arrivals is beyond reproach and of the highest and best international standard and standing. 10. Recent changes to the Migration Act have created a role for an Ombudsman as an outside arbiter. This role is as yet unexplored, but may well be extended in the future. Additional Submission to "Submission No 8"
Summary: The primary refugee determination system and also the Refugee Review Tribunal determinations have led to prolong the sheer agony of thousands of asylum seekers who asked for Australia's help when they arrived, especially for 'unannounced arrivals'. The failure of these processes has become part of the problem instead of the solution. Australia should urgently implement considerable and lasting changes to the procedures and ways of determining claims. It is not true that the length of time spent in detention is a result of 'too many court appeals', but plainly and with overwhelming evidence a result of flaws in the determination process. Attachment: an attachment - not for publication - has also been forwarded to the Committee. This attachment contains the names and contact details of several individuals who have confirmed to be willing to appear before the Inquiry to testify about several issues raised in this and our previous submission. Immediately following the Coalition party room discussions on May 31 2005 of the two Bills seeking considerable changes to the Migration Act, as presented by the socalled "Petro Georgiou group", several coalition MP's have raised suggestions that the time spent in detention centres by asylum claimants could be considerably reduced by limiting the opportunities for court appeals by those claimants, and they announced that upon gaining a Senate majority after July 1 2005, the Howard government would seek to enact limitations to court appeals available to asylum seekers. These opinions were expressed by several MP's, amongst them Mr Malcolm Turnbull, Member for Wentworth, Mr Mal Washer, Member for Moore, the Attorney-General Hon Philip Ruddock, Member for Berowra, and the Treasurer Hon Peter Costello, Member for Higgins. On the face of it, these suggestions sound very plausible, and put so simply, Australian people may well have supported these suggestive propositions if they were presented as part of a political platform. Upon close scrutiny however, the statements are not what they appear to be, because the reason for the many court appeals can be convincingly traced back to what Project SafeCom claims to be a shocking and extremely disturbing error rate in primary DIMIA refugee assessments, which has given rise to lengthy appeals, first to the Refugee Review Tribunal (RRT), and subsequently to the Federal Court, the Full Federal Court, the High Court, and in several cases submissions to the full bench of the High Court. that both phases of refugee assessment are controlled by agents who may well be subject to political bias rather than to be fully in tune with expert knowledge about international standards of refugee assessment, about country information readily available from human rights organisations and refugee organisations, and about internationally recognised refugee law and procedures. This submission also suggests how the changes would improve expertise, impartiality, and fairness to the legitimate claimant in Australia's refugee assessment and determination processes. During this last financial year [2001-02], the Refugee Review Tribunal (RRT) set aside 62% of all Afghan decisions appealed and 87% of all Iraqi decisions appealed. This means that Afghan asylum seekers got it right 62% of the time when they claimed that the departmental decision makers got it wrong. And the public servants got it wrong 87% of the times that the Iraqi applicants claim to have been mistakenly assessed. Frank Brennan's figures put the average error rate of the DIMIA primary decision maker in this context at about seventy-five per cent. When fifty-three Vietnamese asylum seekers in 2003 "almost" entered the Port Hedland harbour undetected on their boat, the Hao Kiet, and were subsequently sent to the detention centre on Christmas Island, initial DIMIA assessment concluded that none of them were refugees. Last week however, on July 29, the last of those refugees flew from the island to Perth, concluding the sorry saga of more than two years of imprisonment for the members of just one large extended family. The Minister for Immigration, the Hon Senator Vanstone, last week also announced she had reconsidered a refusal, by the one RRT member who had concluded in June that 14 members of the group he had reviewed were not refugees, and she admitted that she had done so because their circumstances had been similar to the others, who had already been determined to be refugees. The Hao Kiet story thus produced an error rate of the DIMIA primary decision maker of one hundred per cent. The Immigration Department, then the Refugee Review Tribunal and the Federal Court, rejected Amir's claim for refugee status in Australia. He was one of those asylum seekers that the former Minister for Immigration, Philip Ruddock, would have cited as pursuing unmeritorious claims through the courts. The Minister said that this was to delay departure from Australia. Maybe. But more important for Amir was the sense that his claim had never been properly heard. Other refugees and asylum seekers with whom I have spoken have said that their treatment on arrival - often kept in isolation and being denied access to legal advice and information about the refugee determination system, being told that Australia would not accept them and that they should return - set the tone for the rest of their time in Australia. Upon arrival in Australia, he was granted a short initial-entry interview in which he gave the Australian authorities some basic details about his identity and where he had come from. He was then 'screened out': immigration officials deemed, from his cursory interview, that Australia had no protection obligations towards Mr Al-Khateeb. Unlike those 'screened in', he was denied the right even to apply for asylum. So he - and others from his boat - sat for six or seven months in 'separation detention', a part of the detention centre in which those people who were 'screened out' were kept away from other detainees and where they were denied access to any means of communication with the outside world. Twice a day, for ten minutes, he was allowed outside for a cigarette. If the primary determination by officers of DIMIA is in serious discredit to the point where an outside observer may well say that if DIMIA were a private company, its shareholders would have long left, the board would have long ago been sacked, and the company would be in receivership, then it is all the more important that the Refugee Review Tribunal performs impeccably, thoroughly, and with the highest credits and standard. plenty of credentials, but the right ones? That cannot be claimed however, and recent writings of Professor Mirko Bargaric - a part-time member of the RRT - his questionable opinions on torture and the ensuing media frenzy have shown some shortcomings of the RRT structure. The members of the RRT may well be senior public servants with a good track record, some lawyers, some academics, but that says nothing about their capacity to review places of danger on the world map or about their capacity to patiently hear, work with interpreters, or independently assess, also independently of international politics, asylum claims, where things are often a matter of life and death. In the RRT the term "tribunal" is a disturbing misnomer, because just one person constitutes that "tribunal", and the member does not have to be physically present - the claim can be heard by videolink. Does the Senate Inquiry know all the anecdotal stories and details of all the Federal Court cases where an RRT member was plainly wrong, where the member did not seem to show any interest in the claimant or the case whatsoever, or where the member showed serious lack of knowledge, whether this was country-specific knowledge or other facts about forms of acknowledged persecution in countries, widely known amongst representative organisations such as Human Rights Watch, Amnesty or UNHCR? Is the Senate Inquiry informed about the percentage of RRT determinations that were re-determined after court actions? Once more back to the Vietnamese from the Hao Kiet: about two months ago most of the 53 asylum seekers were granted a Temporary Protection Visa. But at the time they were almost ready to embark on Federal Court action after the primary assessment determined they were not refugees, and after the RRT determination affirmed this refusal. Shortly before their Federal Court action however, the lawyers were informed by the DIMIA that "an error of law" had been made and they were given permission to return to the RRT. Following this admission that both the primary decision maker had been wrong and that following this the RRT had been wrong, the RRT member who dealt with "most" of the application that returned - following the DIMIA error of law admission - to the RRT found them to be refugees. Yet another member of the RRT remarkably, then maintained that fourteen members of this same family brought before him, were NOT refugees. So last week, the Immigration Minister Senator Amanda Vanstone, so it was reported, had intervened because the remaining Vietnamese claimants were in a similar situation as those approved earlier when re-assessed by another RRT member. With that statement she only just stopped short of admitting the negative RRT member decision, determining that the last fourteen Vietnamese claimants were not refugees, was seriously flawed and had to be overturned through her intervention. In May 2001, Roqia Bakhtiyari had her application for a protection visa refused. The decision-maker did not believe her story. Roqia appealed this decision to the Refugee Review Tribunal. While accepting that Roqia was a Hazara, the tribunal member, Genevieve Hamilton, determined that Roqia was not from Afghanistan. In part this assessment was based on a language analysis which found that the dialect she spoke originated in Pakistan. Furthermore, Hamilton noted, Roqia could not name the currency of Afghanistan. Hamilton found this 'barely plausible'. She found it implausible that Roqia could not name the months of the Afghan calendar. Roqia could not explain the route she and her family had taken from Afghanistan. Nor was she able to describe, to Hamilton's satisfaction, her life under the Taliban or recognise the language spoken by the majority Pashtoon ethnic group in Afghanistan. 'This is simply not possible if she lived in Afghanistan,' Hamilton wrote. Roqia claimed that she had led an extremely sheltered life. Hamilton found her credibility 'remarkably poor'. She called Roqia's responses 'facile' to questions about her husband's treatment at the hands of the Taliban and her failure to question the people smuggler she had used about her husband's whereabouts. But Hamilton's written decision reflects as much about her own lack of imagination and intellectual sophistication as it does Roqia's ignorance or duplicity. It seems not unreasonable that a woman who had grown up in an extraordinarily patriarchal society where she was confined to the home, where she had lived in an exceptionally remote area whose economy was predominantly barter oriented, and where, because of years of war, currencies rose and fell with the fortunes of the battlefield, would not know the national currency of that country. Nor is it obvious that such a woman would speak in detailed terms to her husband, in the single night they had together before he fled, of his imprisonment under the Taliban. The writer of this submission would call it the His Masters Voice effect. There is no doubt that the damaging undermining of internationally formulated rights also of unannounced boat-arrivals by politicians in the lead-up to the 2001 Federal election has brought the DIMIA staff member charged with Mr Al-Kahteeb's group in the detention centre to add to him "You don't have a chance in Australia and you are illegally in Australia and we don't accept you". We contend that this attitude points straight back to a combination of the Prime Minister's election slogan "We shall control who comes to Australia and in which way they come" and the rather hissed and strangely stressed repeated labelling during media interviews used by the former Immigration Minister to denote boatpeople as "unlawful non-citizens", giving rise to the notion amongst millions of Australians as well as detention guards and DIMIA staff to think that it's "illegal" to come to Australia on your own steam and ask for asylum. A brief mention needs to be made of other issues intersecting with refugee assessment. This submission will only summarily mention the issues of language assessment and of dob-ins. Finding qualified interpreters who were fluent in Dari, Farsi, Hazargi - the three languages used by Afghans - and English was nearly impossible. In the end, DIMIA drew many of its interpreters from the previous wave of Afghan refugees - those who had fled to Australia during the 1980s when Russia and the United States turned Afghanistan into yet another Cold War battleground. These were almost exclusively Pashtuns. The problem for the Hazara Afghans, who made up the bulk of the asylum seeker population in detention, was the deep ethnic animosity and power difference that exists between the Pashtun and Hazara tribes. It is not clear whether the Department of Immigration was unaware of these tensions or just unconcerned by them. Whatever the reason, interpreters and translators who were used extensively in Woomera, Port Hedland, Curtin and Nauru were Pashtun Afghans. High-profile Melbourne barrister Julian Burnside QC has compared the use of Parshtoon language interpreters to aid in the assessment of refugee claims of Hazaras with putting a Nazi in charge of the refugee assessments of Jews. Since The Palmer Report became public in July this year, we know that the DIMIA is a government department that has been for some time deeply devoid of measures of accountability, managerial checks and balances and systems of information review and confirmation - or conversely, void of systems that may lead to elimination or dismissal of information that cannot be confirmed. In such a climate a situation may arise where an anonymous dob-in can develop its own life, remaining unconfirmed, and growing in importance and significance beyond any proportion related to its relevance, and more importantly, its credibility. A well-developed attunement to the specific refugee circumstances and the international rights, also for unannounced boat arrivals, as laid down in the UN Refugee Convention by the primary decision maker - decision makers seem to lack the determination to consider approval and seem more driven by the determination "to keep them out of Australia". This may well be entirely in line with DIMIA's core mission - to keep unlawful entrants out of Australia - but the consideration of asylum claimants should perhaps be inversed - it should be about a desire to be inclusive and a positive determination to approve, because refugee status can often be, and also often is, about life and death matters. Possibility of political bias - refugee determination is not a political issue, but an internationally recognised human rights issue. Entry of covert bias from other sources - such as language determination by ethnically hostile groups and anonymous dob-ins that develop systemic validity without any basis for sustained credibility. It is extremely likely that the long duration of refugee assessment and consequently the time spent in detention centres is entirely a result of the abysmal refugee determination failures. Conversely, it is extremely unlikely that the intent expressed by Mr Malcolm Turnbull, Mr Mal Washer, the Attorney-General Hon Philip Ruddock and the Treasurer Hon Peter Costello to limit court appeals available to asylum claimants have any basis in a causal relationship to the duration of detention. Until we have a zero error rate in refugee determinations we simply cannot deny asylum seekers the right of an appeal - even if that means going all the way to the High Court. It may well be true that people are spending an indeterminate, and in our opinion a totally unacceptable time locked away in detention centres, but if primary determination would have been without errors, professional, swift and fair, instead of seriously compromised with for example political pandering to the false notion of "illegality" we would have been able to release most people indeed 90% of the time within 90 days. And, that would save millions, possibly billions of dollars. Primary determination and Refugee Review Tribunal reviews should not be controlled by one person and should not be based on one interview. The process of determination, since it consists of two distinct tasks, first the collection of information and second the making of the decision should reflect these two phases. No determination should be made until all information is complete, recorded and fed back to the applicant. It is not until the applicant and his/her agent or representative agrees that the information is complete, reflects what has been supplied, and is sufficient for the claim, that the next phase can start. Migration agents with specific country knowledge should at all times also be consulted in this process. The information collected should include independently gained country information from agencies such as Amnesty International, Human Rights Watch and UNHCR, and also the Department of Foreign Affairs. At all times a refugee lawyer should be present to stand by the applicant. Based on the shocking error rate of the DIMIA assessments, the claimant now also needs "protection from the DIMIA assessment bias". This lawyer or representative should be independent of government, and possibly should be approved in advance by a bi-partisan forum or recommended by an impartial agent. Great care should be taken to avoid the situation where language assessment or other country-based services are retained from an ethnically hostile population group. A national list be compiled and kept up-to-date of accredited and highly credited migration agents with specific country knowledge. This would enable the refugee assessment team to access people with specific knowledge of situations in countries such as Iran, Congo, Zimbabwe, Afghanistan or whatever country it may be. Project SafeCom proposes that the Migration Act be amended after the Inquiry receives all advice relating to the above submission. It is unacceptable that Australia, a country that seeks to boast about its human rights record is in such a shocking state in terms of its treatment of refugees and asylum seekers. While we do not claim to be "experts" and while this submission may not necessarily be perfect in the views of those with more knowledge of what has happened to refugees, we are as we always have been, a fierce and independent voice for justice and fairness.